Illinois Gov. J.B. Pritzker claims one of his core motivations for scrapping Illinois’ constitutionally protected flat income tax – aside from raising $13-$18 billion to pay for campaign promises – is to reduce income inequality. 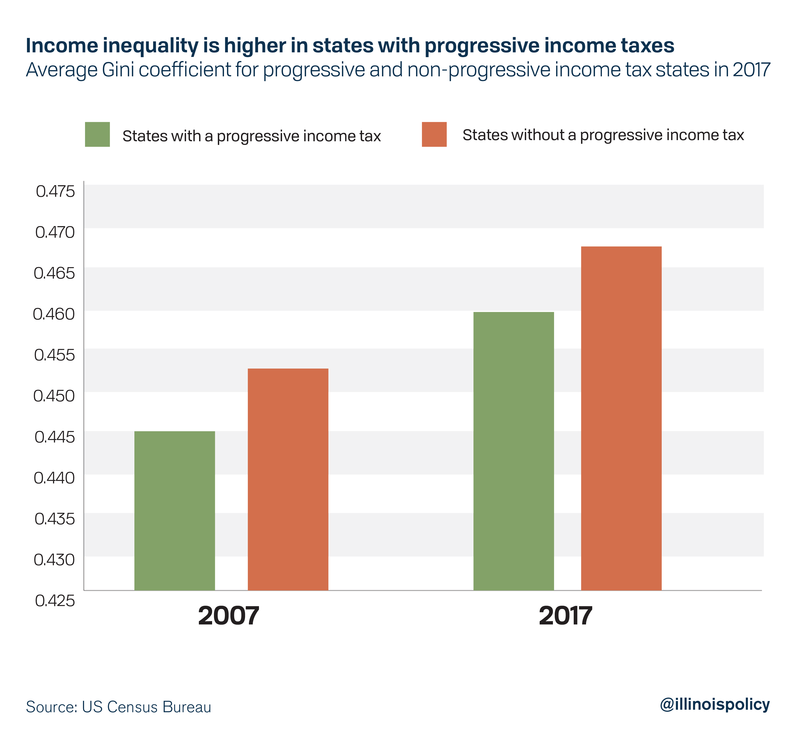 Unfortunately for Pritzker, states with progressive income taxes have higher income inequality and have failed to slow the rise in inequality. Before the Great Recession, states with progressive income taxes had higher income inequality, measured by the Gini coefficient, than states with flat or no income tax. A decade later, not only do states with progressive income taxes still face higher income inequality, but the difference in income inequality between them and states without progressive income taxes remains the same. In other words, the progressive income tax has had no effect at combatting income inequality. That probably explains why the academic literature remains divided as to whether progressive income taxes have any effect on income inequality. While the progressive income tax hasn’t had an effect on income inequality, the expert academic literature is clear that a progressive income tax is far more harmful to the economy than a flat income tax. Because progressive income taxes have such a negative effect on the economy, they tend to make everyone worse off. Even those who may see a tax cut suffer when the progressive tax leads to fewer jobs and decreased productivity because investment shrinks. The taxes cause incomes adjusted for the cost of living to decline, leaving everyone worse off than they would be under a flat tax system that raises just as much tax revenue. The trade-off between equity and efficiency of progressive tax systems has received considerable attention among economists and tax experts. However, progressive taxation has failed to reduce the gap between the rich and the poor, while still distorting market activity. The last state to introduce a progressive income tax was Connecticut. More than two decades later, inequality in states with a progressive income tax is still higher than in other states. In 2017, Connecticut was the state with the second-highest income inequality as measured by the Gini coefficient. Evidence from Connecticut suggests the state experienced significant harms by switching from a flat income tax to a progressive income tax. 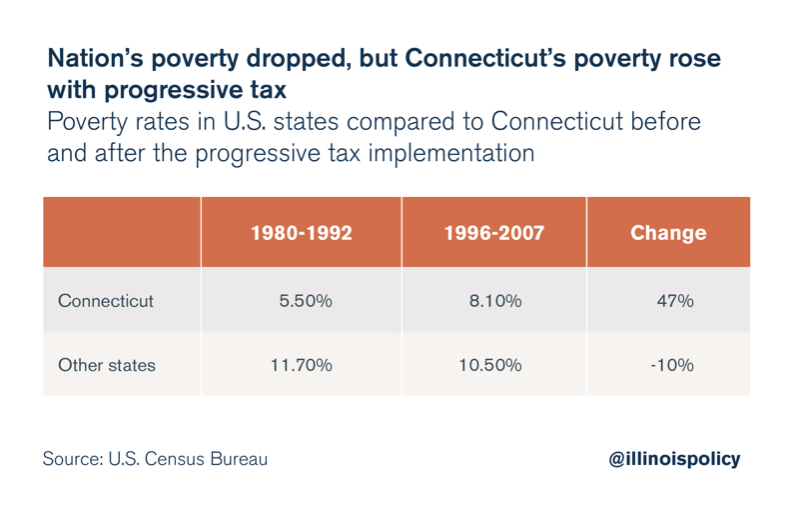 In the years after adopting a progressive income tax, the poverty rate in Connecticut rose 47 percent. Meanwhile the poverty rate in other states fell by 10 percent. The progressive income tax accounted for 73 percent of that increase in the poverty rate. 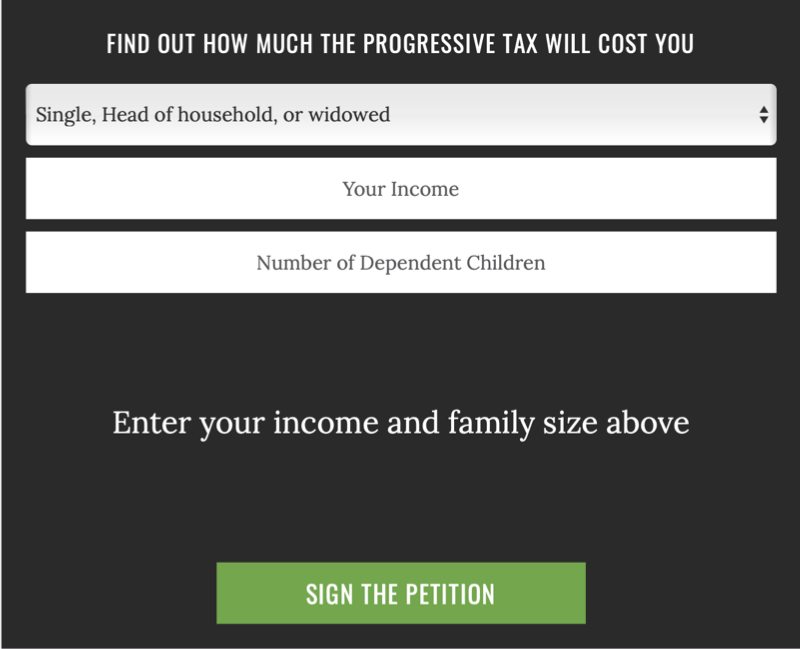 The Connecticut progressive income tax was also sold with the same false promises used by Pritzker in Illinois: middle-class tax relief, property tax cuts and reduced income inequality. Progressive income taxes have higher income inequality and have been unable to slow the rise in the income gap. After adopting the progressive income tax, Connecticut saw a rise in the poverty rate, middle-class income taxes rose by more than 13 percent andproperty taxes as a share of income have risen by more than 35 percent. Connecticut is the only state to move toward a progressive tax in the past 30 years. That state’s bad experiences should tell Illinois leaders there are better solutions than further damaging Illinois’ economy. Next articleIs Amazon Finally Failing?